What does the Board want from its legal advisers? As a result of my experience leading a company for a period earlier this year, I've been asked on several occasions to speak to groups of lawyers about the role of a company's in-house Legal Department when viewed from the CEO's chair. The exact questions that people suggest I attempt to answer vary and are phrased with more elegance but, in ordinary language, they boil down to this: (1) What is Legal's job? (2) How is Legal doing? (3) Does anyone care? Arguably, there's a danger of Legal Departments becoming overly introspective in seeking to answer these questions. Indeed, in the very first post on this blog, I asked "Why is it that, when it comes to the world of business, lawyers spend a lot of time agonising about their role and trying to articulate clearly how they add value, instead of getting on and leading their organisations?" But that was intended to be provocative and it's too harsh. 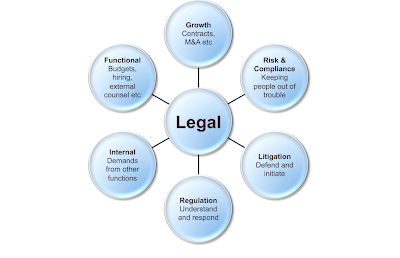 Legal departments have been on a necessary journey over the past 20 years, defining more carefully the scope of their role and whether and how that ought to change in response to the various crises we have seen in businesses, from Enron to the banking industry. Legal teams have become increasingly clear in articulating their role, although not yet, in my view, clear enough. I'm well aware that the use of the kinds of diagrams with arrows you see in PowerPoint slides will attract derision from that part of our profession that thinks they're for the simple-minded. Nevertheless, I'm going to illustrate this post with a few such diagrams of my own. 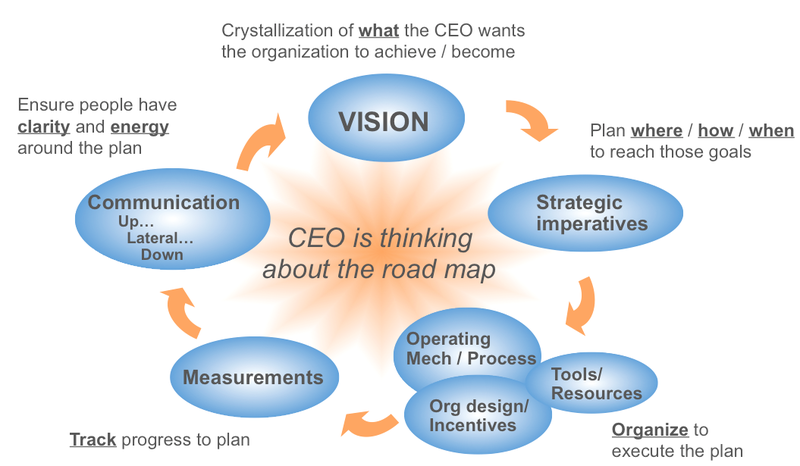 In order to avoid the temptation to be introspective, let's start with what the CEO is thinking about. The answer, of course, is very different from what the Legal department is worrying about. 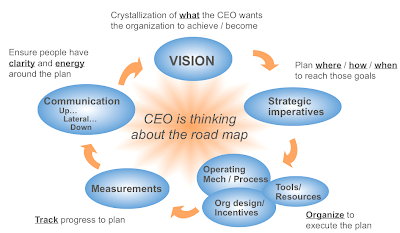 Any company's CEO is focussed on a few strategic imperatives. They may change over time, but at any given moment, there are not going to be many of them. In my own case, I had five. To get a large group to achieve a difficult goal, you have to have more than a plan. You have to organize (which includes putting the right people into the right jobs), communicate so that everyone knows where you're trying to get to and measure, so you can track how you're progressing. In the hope that a picture really is worth a thousand words, here's my suggestion of what is involved. 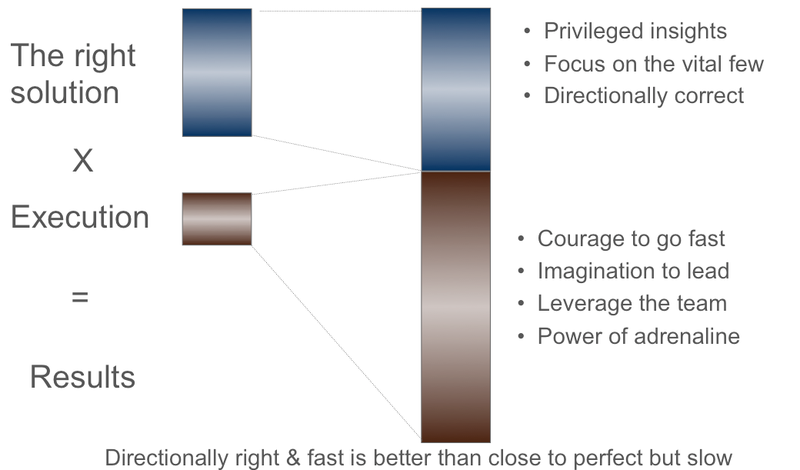 Another thing that the CEO will see differently from Legal is the importance of execution and speed. This is partly down to the different nature of their roles. A lawyer is expected to demonstrate excellent judgement. This is a skill which lawyers, rightly, wish to cultivate and which comes from within - it is a product of the mind. Judgement requires understanding the facts, but it also requires careful thought. Once that thought is complete and has been articulated, the result has been achieved. A CEO has to identify their strategic imperatives correctly, but in order to drive the company to achieve them, they must galvanize the efforts of very large numbers of people. That means a CEO will think about how to achieve results very differently. Time for another picture. So much for the CEO. Unless you're unfortunate enough to work for the kind of CEO who believes, in the style of Louis XIV that "la société, c'est moi" (sadly more common than it ought to be), then the views of others around the Boardroom table are going to be important too. 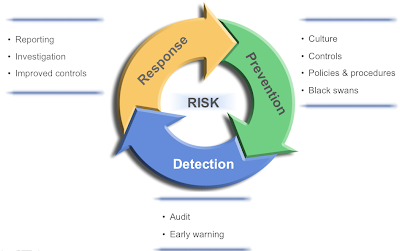 The most important thing to grasp is the role of the Board in managing risk, to ensure that the opportunities and risks facing the company are in balance. There is no shortage of reading on this topic and I don't intend to add to it here. Let's just pause to reflect that entire industries have got this balance wrong in the past decade. At a conceptual level, another picture will help. What I can say with confidence, based on almost every discussion I have with in-house lawyers, is that there is a limitless demand for legal services in any business and the Legal Department often feels overwhelmed and unable to cope. This creates ambivalent feelings in most in-house lawyers. It can cause them to feel angry and frustrated, but they often like the security that comes from feeling wanted and in great demand. The bad news is that people in the Boardroom really aren't judging Legal on how busy it is. That's a resourcing question. I am going to reduce what's needed from the Legal Department to just three things. This time I'll propose a diagram first and then comment on it. First, "Execution". This is probably the element which most Legal teams spend their time worrying about - getting the job done. Whatever the job is (buy company X, enter into an alliance with Y), your CEO and your Board expect Legal to get it done, whether with internal resources or with external help. They also expect Legal not to be spending its time on things which don't matter to the company. Second, "Control", by which I mean the control of risk, and in particular of non-financial risk, or at least risk which isn't directly financial. The foundation of any sustainable company has to be compliance with law and honest numbers. The Finance function, in particular the controllers, are expected to lead the company's efforts to provide honest numbers. The Board will expect the Legal Department to help guide the company's understanding of non-financial risks and to help ensure compliance with law. Legal Departments have, quite rightly, done more and more to define their role in this area during the past decade. Finally, the CEO and the Board are seeking "Insight". Although both the other elements, (Execution and Control) are critical foundations, the ability of the Legal Department to provide insight will be the real differentiator. What's really happening to the company? What's going to happen next? What does it mean? How should we respond? Are we prepared? If the Legal Department can help the CEO and the Board anticipate and understand, then the function will have achieved what is most valued. In my view, the next stage in the evolution of in-house Legal teams needs to be a clearer articulation of how Legal can bring insight. 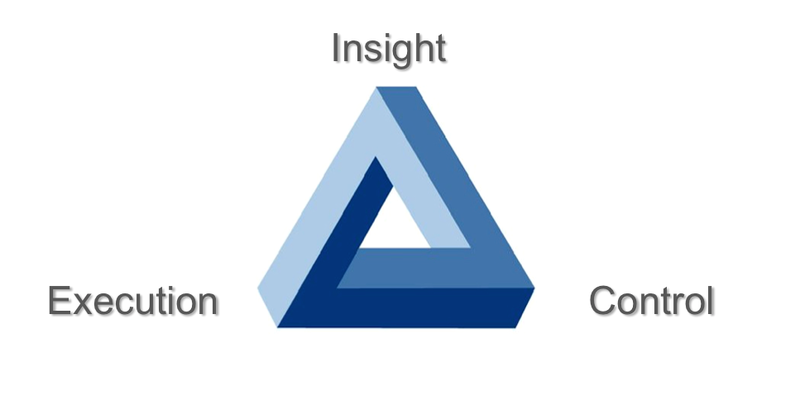 What do lawyers need to do to bring insight? I believe lawyers can bring a great deal of insight to their colleagues in business. To back up this assertion, I would highlight three things lawyers do very well and two things they need to do better to make their insights more relevant to the CEO and the Board. What are the things they do well? (1) Lawyers are very good at absorbing and synthesising complexity. They can master and marshal a large amount of detail and are undeterred by it. (2) Lawyers are extremely resilient under pressure. They are trained to argue from facts and to stand their ground. That makes them good at speaking truth to power. (3) Lawyers are able to keep confidences, something which many other professional advisers seem unable to do consistently. That means lawyers can be trusted with the most sensitive information. What can lawyers do better? (1) Lawyers need to improve their financial literacy. This is really critical. If lawyers cannot understand the financial impact of their insights, they cannot translate them into the language of the Boardroom. 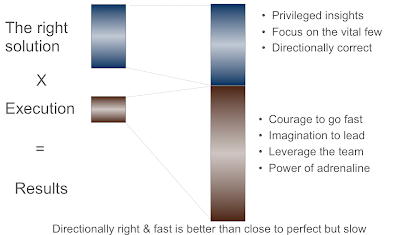 (2) Lawyers need to understand the value of speed and the gap between a concept and its execution. Insights which can't be acted on or which cannot be implemented in time aren't helpful. 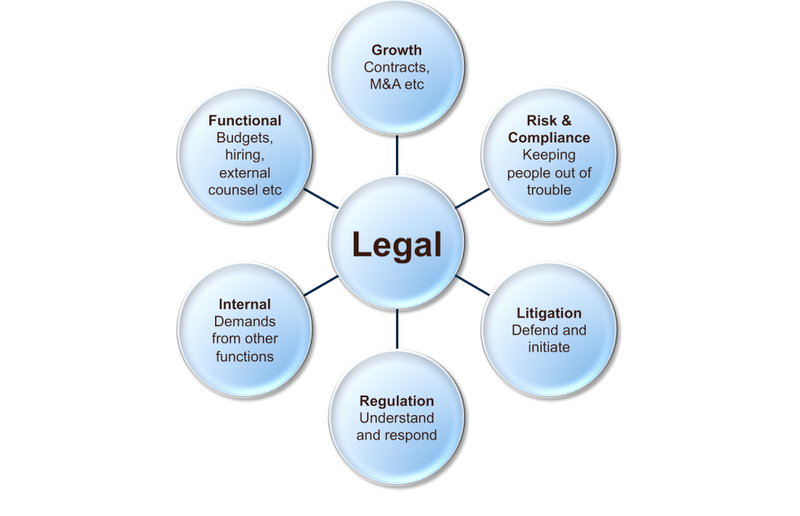 Legal Departments are extremely well placed to develop further as critical components of well-run companies. If they are to do so, they need to concentrate on going beyond execution and towards insight. Based on what I hear from others, I'm a little concerned that too many Legal teams are engaged in the production of management information which is defensive in nature, intended to demonstrate how busy the Legal Department is. I'm not suggesting that MI around execution isn't worthwhile, but some of it may be wasted if it is motivated by defensive thinking. If Legal Departments can bridge the current gap in financial understanding, they have an enormous opportunity to bring their other talents to bear in creating meaningful insights for their businesses. That will bring competitive advantage. And that really will be valued. This is a perfectly crafted article. I have learned a lot. After my provocative blog about British lawyers, some of you were probably thinking of Clement Atlee's immortal comment that "a period of silence on your part would be welcome". However, after reading an interesting post from @BrettTechLawyer, in his guest appearance on @LegalBizzle's blog (here), I'm being lured out of my silence a little earlier than intended. It certainly isn't my intention to question the value and the role of in-house counsel. On the contrary, I believe that in-house counsel are a crucial part of better decision making in companies. My contention is that many companies under use or misuse lawyers, both in-house and out-house. Rather than cast this as an in-house -v- out-house debate, it's more interesting to explore why that is and what we can do to change it. What does Legal do exactly? An elevator pitch. As a junior in-house lawyer, I worked for a company that lost its way a little. Part of the recovery plan was the appointment of a new COO, a well known hatchet man who specialized in removing costs. Our GC was desperately keen that this new COO should meet the Legal team, so he summoned us from around the world to a meeting at global HQ, just outside Boston. For some reason known only to the GC, all 80 of us we were made to line up, like wedding guests, in order to shake the COO's hand as we entered the conference room. By the time I reached the front, about 40 people had already passed. I heard him say "Gee, there sure are a lot of you guys". Several of us winced. I couldn't help responding "We're very cheap" and grinning at him. It was the best I could do at the time, but it's hardly a sales pitch. Tom's career has been spent as a member of successful leadership teams in global companies, helping grow and transform businesses. Tom is a qualified lawyer and a science graduate. He has held various leadership and advisory positions, as COO, General Counsel, Chief of Staff, Head of HR and as CEO. You can find fuller details at http://uk.linkedin.com/in/tomkilroy/. Tom believes lawyers can play an important role in well-run businesses. The views expressed in this blog are entirely Tom's own and not those of any company he works or has worked for.